The use of the term “add-ons” as it pertains to route service businesses aptly fits in more ways than a just the literal one — not only do they “add on” to the inventory sold, they also add on to the confidence the consumer already has with the company selling the original service. Even more, employing route optimization is an ideal way to offer an added edge over those you compete with, all of which amounts to increased ROI, efficiency and annual profitablabilty. But what are the actual financial benefits involved with adding on services to a route business, and how does a route service operator choose the right partner? This article will provide a quick overview of the route service and pest control industries, explain the similarities between each, link you to a number of valuable relevant articles, introduce you to our air freshening products and their marketability and wrap with an example of an active successful implementation of Air-Scent products being added on to an existing pest control route service. Some examples of very lucrative route services include: vending, coffee and water services, textiles and uniform rental, restroom hygiene services and of course the topic at hand — pest control. Regardless of the service, each are dependent upon one stabilizing factor: the standardized delivery of the services and/or products they represent. Modern industry is extremely diversified and often very complex, and as the world shrinks with advances in travel and telecommunication, effective route services often close the sharp divide between the success or failure of meeting that supply and demand. Once the new add-on products or services become consistently delivered and accepted, there is an understandable shift in company management focus from learning how to sell and deliver these services in a cost efficient manner and addressing the problems and incentives of their customer base. It’s at this infection point that route operators are effectively aimed towards enhanced success and bottom line. What Makes Air Fresheners Perfect For Pest Control Route Services? According to Gary Curl, founder and president of Specialty Consultants, the current pest control industry has an estimated annual income that exceeds $8 billion. A staggering number to say the least, but that number might be even higher with the addition of air-freshening products and services. Even more, their logistics are more alike and mutually beneficial than most might realize. Ironically, commercial pest control operators already carry all the tools they need for quick installations, so commercial pest control companies can begin servicing clients as soon as they receive their supplies. Pest control routes require the exact same servicing cycle (every 28 days) as most commercial and industrial air freshener businesses, so important add-ons can help to reduce overhead costs such as fuel and vehicle maintenance and save time, a priceless commodity no product distributor can ignore. The bottom line to your bottom line amounts to one very clear fact — incorporating new add-on products to an existing account where you have already gained respect and an established presence is good for both business and that all-important ROI, which as we all know looms over every decision any smart businesses owner ever makes. We recently explored the top ten reasons why route service operators and entrepreneurs across the globe are choosing to distribute our products, and point number ten in that list explained how our air freshener add-on products and systems are a much softer sell than the classic stereotype of the items promoted by that harried salesman desperately trying to get his foot into a door that is about to be slammed in his face. For more than seven decades, our cutting edge technology, innovative technical strategies and state-of-the-art diffuser systems have been lovingly researched, developed, honed, and passed down to succeeding generations like prideful family heirlooms. These are the forces behind our world-renown success in the manufacturing of air freshener and odor control systems, underpinning our decades-long success and competitive edge. Our scent-branding applications range from small to large-scale commercial, institutional and industrial environments. The latter is well represented by the Scentsia Line and the Aroma Beam (featured below), albeit these are only a few of many available options. 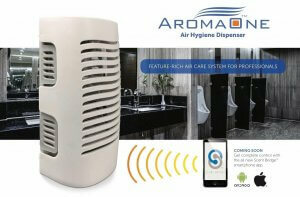 The demand for ambient scent marketing and air-care services utilizing fan air freshener dispensers is constant in this dynamic industry and is expected to glean approximately $92 billion by the year, 2024. Business owners and managers spend thousands upon thousands of dollars every year on environmental odor control products, and bad smells can occur anywhere at anytime from a myriad of sources. For ultimate hegemony over malodors, all business owners and managers must find a way to provide effective, hassle-free around-the-clock protection. Why Are Air-Scent Fan Air Freshener Dispensers So Marketable? You can read more about our long fragrant history here, but the bottom line is we have been on-site testing and servicing hotels, restaurants, medical facilities, showrooms, salons and spas and countless other commercial environments since the mid 1940s. Our fan air freshener dispensers, refills and stunning collection of available scents provide solutions for any desired ambiance. 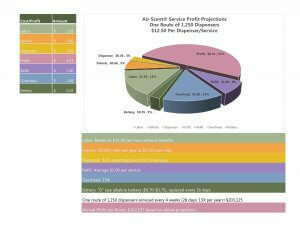 Thousands of companies can attest to the marketability and success of air freshener service routes. Only Air-Scent offers superior odor control solutions by matching the precise product to the application with a customized choice of solid, liquid and natural refills. In addition to servicing and installation being quick and simple, add-on services offer significant profit potential with little investment of both time and money. There are no franchise fees, hidden costs or territorial boundaries and comprehensive customer support program is always available. One very significant factor that predicts success with add-on products for pest control route services is that the distributor does not need to solicit consumers as he or she already has an established customer base even before the process begins! In all likelihood, routes for pest control and potential air freshener services include at least some of the following: doctors’ offices, restaurants, sports arenas, airports, nursing homes, churches and synagogues, retail stores, gyms and fitness centers, theaters, day care centers, schools and office buildings, just to name a few. Adding additional products to a route service line offers fast payback on investment and high profit margins. It is also very easy to get started, as no special licensing is required and on the job training is minimal. This has brought about the evolution of a new commitment on the part of Pestco, a company that has been in continuous operation since the mid 1940s, serving businesses throughout Greater Pittsburgh, all Western Pennsylvania Counties, Cleveland, Eastern Ohio and the West Virginia panhandle. Their Complete Facility Care Program is unique and cost-effective and includes successful pest control and management coupled with Air-Scent air fresheners and environmental odor control strategies along with washroom hygiene solutions from the experts at Enviro-Master. These services are now available in one bundled collection of diverse services for commercial business owners and managers. The incorporation of our air freshener products and services have proven to be a clear example of a successful add-on application to an existing route service business. A pest control route service offering add-ons backed by superior company products and reputations represents a low risk, high profit enterprise for any quick-thinking entrepreneur. Contact our scenting experts today and get started on your new add-on route service distributorship tomorrow.